As an avid Born and Raced in Nebraska runner, Amy Frankforter knew Cornfield Cornfield all too well. 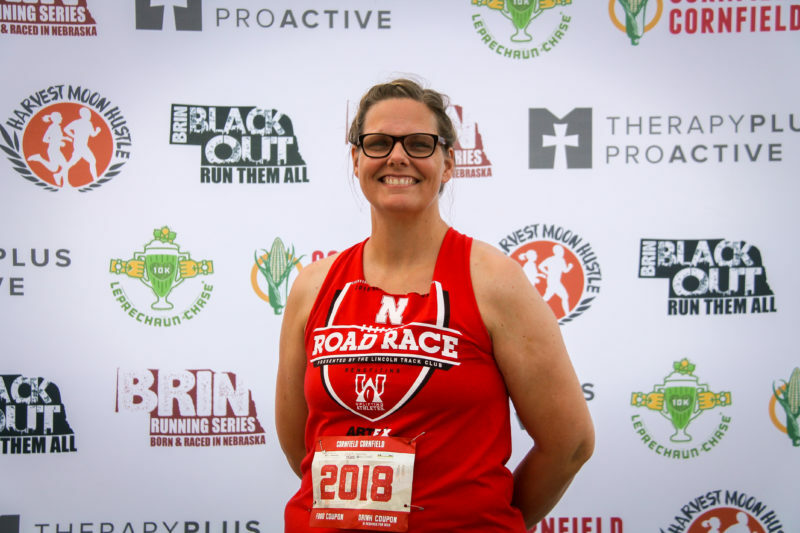 After visiting Synergy Chiropractic Spine & Joint Center for a foot problem, she was offered a chance to run this year’s race for free and jumped on it. We interviewed Amy about her time at this year’s race. Q: How many times have you run the Cornfield Cornfield 10K? A: This was my third year running. Q: How did you win your race registration? A: I went into Synergy Chiropractic Spine & Joint Center to visit Dr. Brad Hochstein and they offered me a free race registration! Q: Why do you visit Synergy? A: I go to Synergy and see Brad Hochstein. He has been great for me because I have problems with my feet. The technique that he uses to release areas in my feet has just been great. I had plantar fasciitis and he recommended a different type of shoe and stretched me out. Such friendly people and his therapy really works. I’m seeing them again because I have a different issue with my foot. They’re very knowledgable with athletes and I think a lot of runners are stopped by injuries because of overuse or as we age things are just don’t work the same way. They do a really nice job of understanding the problem and getting to the root of it. I hadn’t been to Brad for over a year. He helped out so much for my plantar fasciitis that I didn’t have to go back for a long time and I think that’s a testament to what they do. He was able to alleviate that problem. Q: What was your favorite part of this year’s race? A: I think probably two things. The after party and all of the different services and things that are offered plus the vendors were great. Probably this year was the best that I’ve seen it. Second was just all of the different volunteers and how that was organized especially with the storm. I know those volunteers were out there early! Q: What was your least favorite part of Saturday’s race? A: Really, I have to be honest, I think the thing about the race that makes it challenging is the heat. I think what BRIN & Pink Gorilla Events does great is that they start it early in the morning and that’s very helpful. You’re going to battle against the weather no matter what but it’s something you expect. Q: How did you feel Pink Gorilla Events did dealing with the heat? A: I LOVED the sponges this year!! It was perfect. It was exactly what I needed when I needed it. The water stations were placed far enough apart to where a runner wouldn’t get too much water but you get water just at the right time. It was well run. Q: What was your favorite course highlight? Did the cheer stations and cowbells keep you motivated? A: One of my favorite things is the volunteer support. What they’re doing (because it’s a very warm race) is great. There’s a bathroom and water station at the bottom of the hill right before mile 5 and there’s a good cheering station. That’s my favorite and the guy with the hose was great! Thanks, Amy and all our other runners, for joining us this year as we #RunForTheCorn!